In other news, this weekend I went to Bloomington, IN to visit family friends. Steve was in Tennessee at his conference championships (congrats to our Morehead Eagles! ), and so I thought it was a great time to go visit! I had a lovely time with Gloria and Kathy, going out to eat and exploring Bloomington. You can check out my Instagram for more photos. I want to get on to Meatless Monday ! Anyway, this dish is about the max spicy-ness I can handle, but buffalo chicken is one of those flavors I do love! This is inspired by those damn delicious lettuce wraps at PF Changs, but healthier, and well….completely different flavor! I hope you will join Confessions of a Mother Runner and I by adding your recipe to our linkup. Add the buffalo sauce ingredients to a small saucepan. Heat over a medium high heat. Once the butter has melted, stir in the chickpeas. Simmer for 10 minutes, stirring often. Serve all the ingredients on top of the heads of romaine, and enjoy immediately. How spicy do you like your food? Do you have a town/location you like to visit when you have free time? I would probably do a sweet chili sauce in lieu of the hot sauce. I was also thinking pineapple chunks or sweet bell pepper chunks in lieu of avocado. Buffalo sauce is so good. I have been known to just drink it. Not much but still…. Yum this sounds good! I don’t typically do buffalo sauce but I do like spicy! What a creative combination! I’m not a big buffalo sauce person but my husband loves it and I should experiment with it more often! Bloomington is a great little town isn’t it? I can’t wait to explore it more when my daughter gets there. I love lettuce wraps in the summer and the spicier the better for me. YUm! Gosh, you’re smart. This is a fabulous idea and would satisfy the craving I get for buffalo sauce and blue cheese sometimes. Well done! I may spike the recipe with a little more heat (I can’t get enough for some reason), but other than that, this looks delicious. Thank you for hosting the link-up as always. I love these! 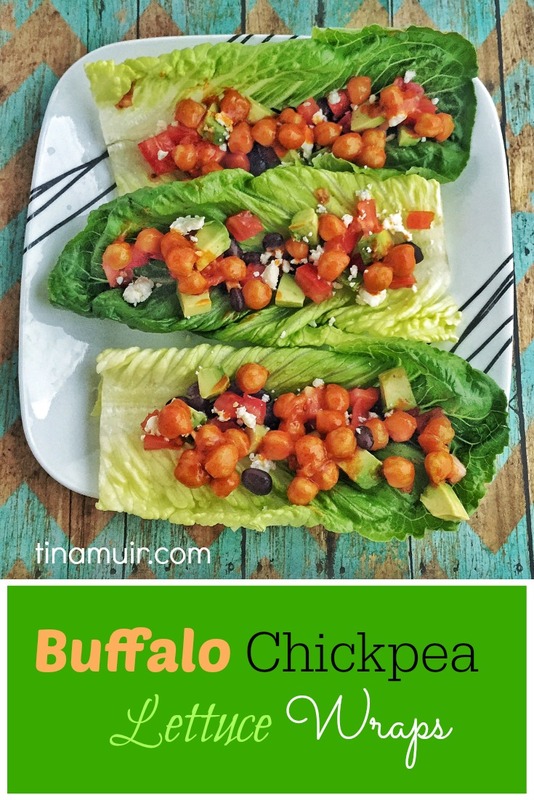 Who am I kidding… I love anything with chickpeas, but especially buffalo chickpeas. YUM. we always love learning about your running, it’s your passion and we love that! and now, i must say, i never thought to make a wrap like this, but I’m so gonna! YUM! You may be jealous of my UK food but I am always jealous of your US food! Buffalo sauce is just such a rarity here, and hot sauce as well isn’t really known about apart from in more ethnic cuisines. Ahh well! Soudns delicious. Chickpeas are one of my favourite non-meat sources of protein. Yum. I want right now. I’m so hungry and this looks delicious. We like it spicy around here! I am the exact opposite. I love everything spicy! And I especially love Buffalo anything. These look amazing. Thanks for the linkup! So funny–my son and I were just talking about chickpeas last night as we wrestled over who got the leftover dish I made the other day with them! Now I can add another recipe to the list–he will be happy! Yep had me at buffalo! I love hot and spicy buffalo! It’s one of those crazy flavors I love and not liking meat and when I was vegan I would put it on everything. YUM!!!! I love this idea!!! I adore buffalo sauce and will try any veggie dish that includes it! Ti Tina,Wow, Nice chickpea wraps. Tina,Please join. I am inviting everybody who is linking in Meatless Monday, it is open for all. K, these are brilliant. I drench all of my food in hot buffalo sauce, so this meal will fit nicely into our lives! This sounds delicious! I’m getting more adventurous with heat and buffalo sauce is definitely one of my favorites. And when combined with chickpeas? YUM! Ohhh, Iove spicy food! The hotter the better! This looks so easy!! I haven’t had lettuce wraps in so long!! I like heat, but my 4 year old doesn’t – so perfect for family dinner. I love the spice! Bring it! And love the simplicity of this recipe. Perfect for a busy weeknight meal. These sound great! I just saw a recipe for buffalo chickpea wraps of PPK and I thought “that sounds amazing!”. I’m going to try this one very soon. Yes, I can’t wait to try these! I love everything buffalo, especially ways to use buffalo sauce/flavor with vegetarian options. I love that this is a fresher way to get in my vegetarian buffalo fix than the Morningstar Buffalo Chik’n patties and nuggets that I’ve been going to when I want to get my buffalo fix. 🙂 Thanks for sharing another great recipe, Tina! I love lettuce wraps of any kind. I would love to a try your meatless version with chickpeas!